How do I behave morally? This has been a central question in my search for wisdom. In recent discussions I have found that some people think that science can answer all questions relevant to human lives. This belief has been called "scientism" and is held in particularly high regard by people such as Sam Harris. But I am not sure it is true. Are all questions answerable by science? Can a scientist tell me how to behave morally? Let us look at how Sam Harris might answer this question. Premise 2 can be easily established through observation. Premise 1, on the other hand, defines what morality is about. Oh dear. I am now afraid that my question has remained unanswered. 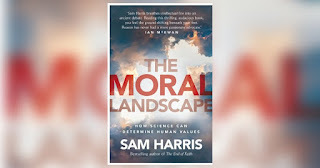 Harris suggests that science can tell me what is moral, but his argument only works if he starts with a definition of what is moral. That definition is assumed and was not established through science. Harris, therefore, has not explained how science can tell me how to behave morally. It is as if he is saying "Allow me to use science to tell you how to behave morally. But before we begin, we need to state up front that behaving morally is improving the well-being of conscious creatures".